With its population of roughly 400,000, Cluj-Napoca is the fourth largest city of Romania and the historical center of the multicultural region of Transylvania. It is also one of the most important educational, political and economic centers of Romania. The city has a population of diverse, ethnic backgrounds, mostly, Romanians and Hungarians. It is famous for its flourishing cultural scene, and because the city has around 100,000 students looking for entertainment in their spare time so the nightlife of the city is world-class. Cluj-Napoca never faced a large-scale reconstruction program during the communist era. Meaning, most of its historical downtown is left intact. Most buildings being constructed are in Renaissance, Baroque and Gothic styles. Also, there are a number of remarkable buildings from the mid-century style. The city has the most important university in Transylvania. The Babeş-Bolyai University (UBB) is the largest in the country, with approximately 50,000 students attending various specializations in Romanian, Hungarian, German and English. The second largest university in the city is the Technical University of Cluj-Napoca, having seven faculties. The two universities have a total of about 1,300 places on B.A. level in different IT-related fields every year. 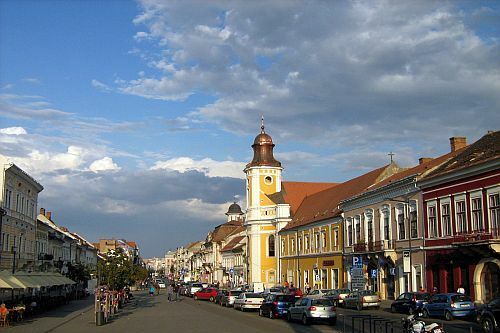 Cluj-Napoca is also the largest regional transportation hub with direct road, air and rail connections to major cities in Romania and Europe. The city is on three different European routes: E60, E81 and E576; and three main national roads: DN1, DN1C and DN1F. The Romanian Motorway A3 links Cluj-Napoca to the Hungarian and Bucharest borders. Cluj-Napoca International Airport is the fourth busiest airport in the country. The city is renowned for its young, competitive workforce with good foreign language skills and technical proficiency at a competitive wage rate. Cluj-Napoca houses the regional or national headquarters of Aegon, Groupama, Mol and Bechtel. Nokia also constructed a mobile phone factory at Jucu, near Cluj-Napoca. To name a few of the largest companies that have offices here, the city hosts shared service centers and business and knowledge processing companies such as KPMG, Office Depot, Sykes, Genpact, PwC, Emerson, EXL Service, HP and Deloitte..
As for the salaries in Cluj-Napoca, an entry level programmer earns a monthly net salary of about 500 euro ($715), while a senior developer’s monthly net salary can reach about 1400 euro ($2,000). To arrive to a gross salary, the employer must add 42.5 per cent of social security tax, and additionally 28% to reach total cost of employment.